I can hardly believe it, but I'm nearly finished with the book! Not quite though, because I'm a crazed tweaker. It's especially hard to let go of a series, because whenever I look back at a piece with fresh eyes I always see something I want to change! But at some point you just have to surrender. 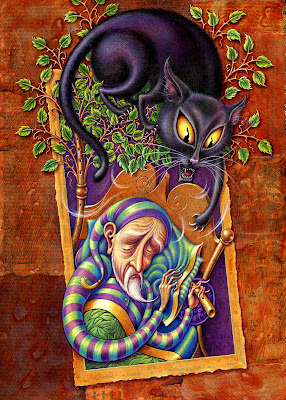 In this image the old man is dreaming of the black cat, & fearing for his magic flute. Acrylic on text & maps on canvas, 9x12". Click for a closer view & to find the hidden cat. For The Old Man and the Cat, by Anthony Holcroft, to be published in 2011 by Penguin NZ. I love your pictures, and this is another fantastic one. The cat's fur is so well done! Really wonderful work Leah!! I love an image that I can step inside of! Really beautiful! As the kids, say here, "You have mad skills!" Wow, I love the color, design and texture! wonderful! The cat fur- how long did that take?? wow! Yo have derivan products there by any chance?